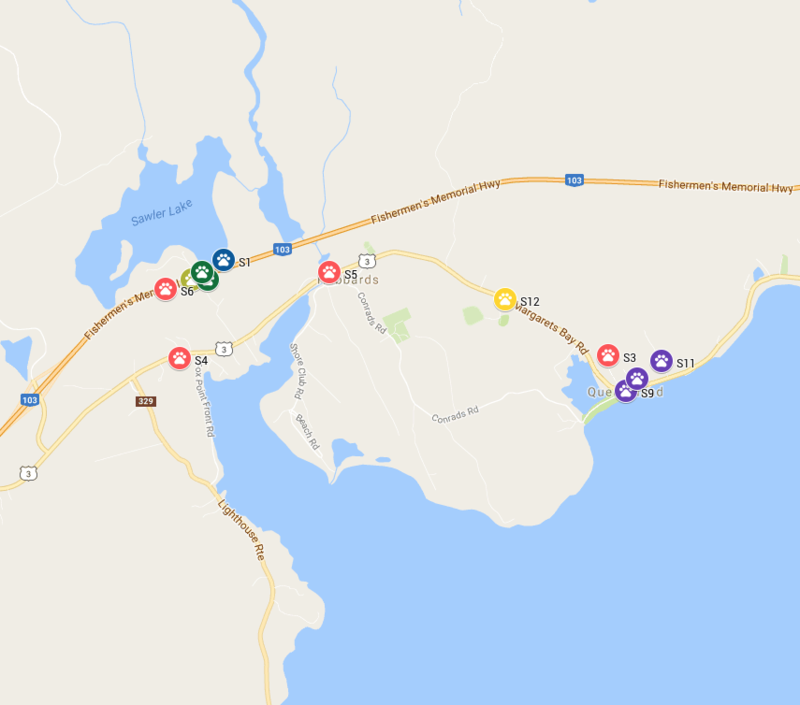 The government is checking for what toxins are present in the Blue-Green Algae blooms that have appeared in several of the Dartmouth Lakes, including Lake Banook and MicMac. Please DO NOT allow your dog to swim or step into the water where the blooms are present as it can be very toxic to our pets, acting extremely quickly, which could lead to death. 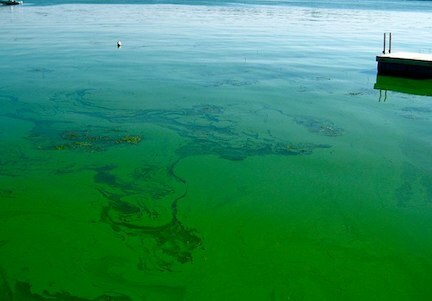 Please check with your Local Municipalities for any Blue-Green Algae Blooms in your area before allowing your dogs near the water. 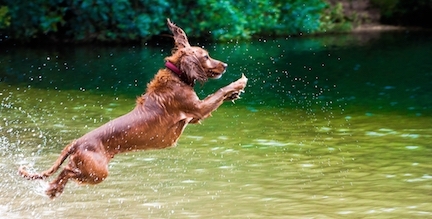 KEEPING DOGS SAFE DURING STORMS: What to do? Have your dog’s updated ID tags on their collar and the collar on them at all times during a storm. We recommend having your cell phone on your dog’s tag and that you have a dog licence from your municipality. Also, have your dog microchipped and the information kept up-to-date with the chip company/vets. 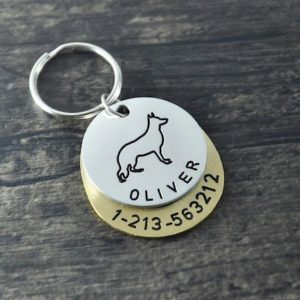 If you don’t have a tag available, as a temporary ID use a black marker to write your cell number either on tape around or the webbing of their collar. 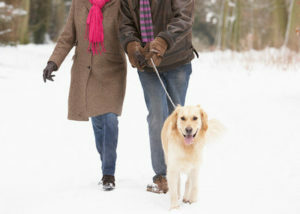 Take your dog for a long walk as you both may be housebound for a few days. 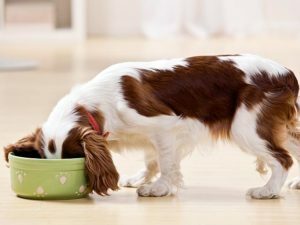 Make sure you have enough dog food and medications in stock for both you and your dog. They recommend at least 72 hours worth. Get out your dog coats/sweaters and boots because when your dog has to go, they have to go. 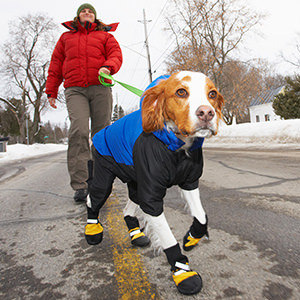 People will be using a lot of salt with this ice build up, so be prepared with dog boots or ointments to reduce the risk to your dogs pads. Have towels ready to dry off your dog after being out in the storm. Prepare ahead of time and have a plan for your family and your pets incase you had to evacuate your home. 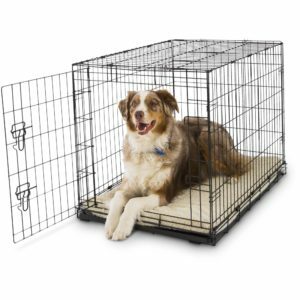 You can find a great article on planning ahead for your pets safety during an evacuation here. And disaster preparedness for pets here. 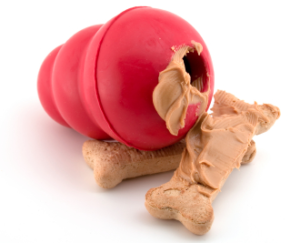 Stuff kong’s with your dogs food or special treats, use interactive toys where both you and your dog work together, have chew toys ready: Your dog will be anxious and active and you will need to burn some of that energy off while indoors. You can find a copy of this list for printing here. Please keep them on leash, even within a fenced yard during the storm. Winds, heavy ice build up, noise of salt trucks, falling branches, etc. All these things can cause your dog to bolt. 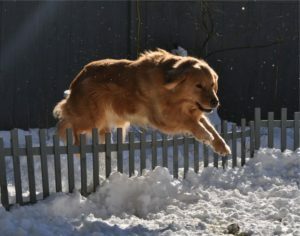 A dog bolting from fear can leap high fences and/or run for long distances. The risks are too high during the worst part of a storm, so be prepared to keep your dog inside and safe. 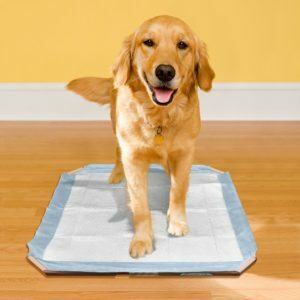 Take your dog out before the worst hits, create a potty area/pee pad inside your home so your dog is comfortable. Don’t feed your dog during the worst part of the storm. Stay calm so your dog stays calm as well. Don’t forget to keep your dog warm by providing them with blankets or sweaters. 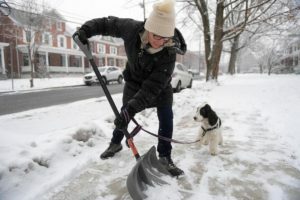 Please keep your dog leashed or tethered when they are out with you shovelling/salting/cleaning up. 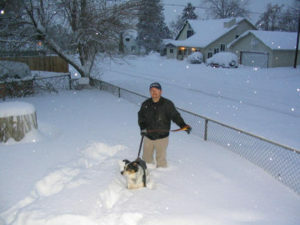 Often people let their dogs play in the snow while they shovel out the cars and driveway. 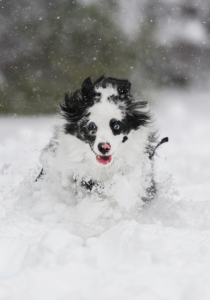 With snowplows, high winds, and all the other dangers out there, we advise that your dog be on a long line, on a leash, tethered safely or simply kept indoors. 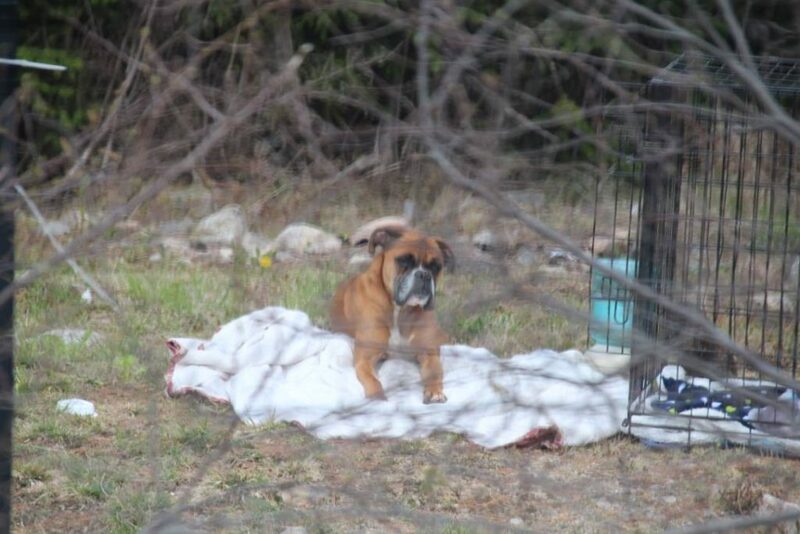 Call your local Animal Control or the Provincial SPCA Cruelty Investigations to report a dog left out in the cold. You could also try your local Police or RCMP. Contact Information listed by County for Nova Scotia can be found here: www.ns.lostdognetwork.com/contact-list/ If you feel comfortable, doing so at your own risk, please consider offering this pet shelter, in your home, basement, garage, or even a shed. 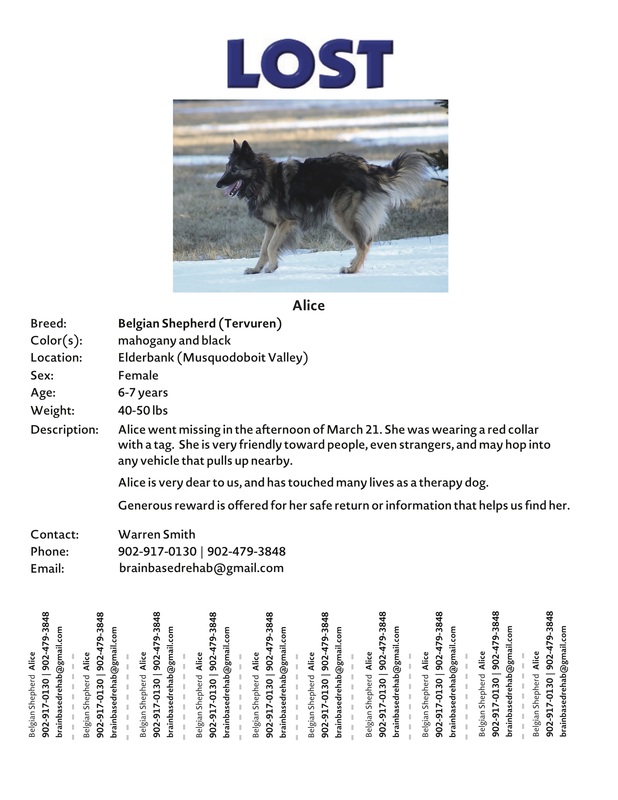 You should also report finding this pet to local online community pages (lost pets, community centres, yard sales, etc.) and place a free ad on Kijiji.ca under Pets: Lost and Found. Thank you. Thoroughly check the yard after the storm for any gates blown open by high winds, broken fence sections, hanging or downed branches/trees, power lines down, live wires, etc. Additional Info: Animal Control was alerted, but would not respond unless the dog was contained. It was last seen going into the woods behind Mayflower Mall. October 4, 2017 article in the Chronicle Herald about a dog surviving an attack, in it’s own backyard, by a coyote in Eastern Passage, NS. We see very few of these types of attacks, but I think the important things to note are that Coyotes have been heard in the area lately, the dog was off leash, and an e-fence was in use – that means the dog would be unlikely to leave the property but it does not stop wildlife or predators from coming onto the property. 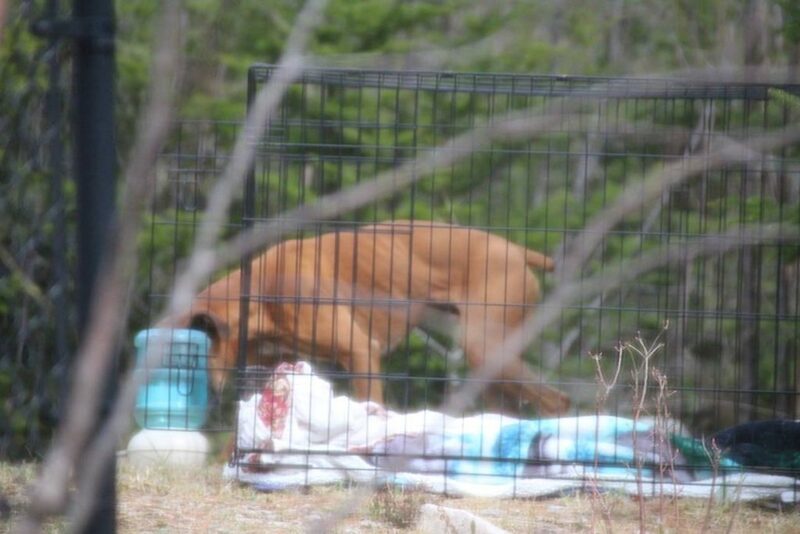 The article references local wildlife experts who encourage folks to educate themselves on how to stay safe while living next to wildlife habitat (this dogs home is surrounded by woodland). We understand and appreciate that every situation is not avoidable and we are not pointing fingers. However, we do want people to learn from these experiences and to engage all possible preventative measures to keep their pets safe. We wish Daisy a full and speedy recovery from her horrible experience. 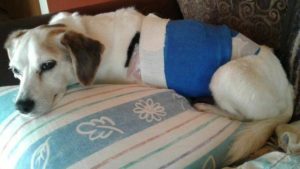 Dawn Harmes’s dog Daisy is facing a long recovery after a harrowing coyote attack. Harmes let Daisy out of her Eastern Passage home for a little backyard exercise at about 6:45 Friday evening. There are extensive woods around the property but Harmes has an underground electric fence so Daisy won’t go too far. On Friday, she went out with Daisy but the dog wasn’t on a leash. Daisy is a beagle-Jack Russell terrier mix and moves pretty fast. She started running toward where the yelping was coming from, and found Daisy with the coyote. “She had gotten away from it, but I don’t know if she had done it on her own or maybe because I had started screaming and startled the coyote or what. That’s when Harmes saw the trail of blood. She didn’t know the extent of the injuries at the time, but knew it was bad. Too shaken to drive, she called her father, who lives nearby, to help her rush Daisy to the Eastern Passage Village Veterinary Hospital. Her father came within 10 minutes, though, and they took their wounded charge to the vet. Harmes said the vet told her she could clean Daisy’s injuries and stitch up some punctures. But the bites had punctured through her abdominal wall, threatening internal damage and the risk of infection from bacteria in the air and whatever might have been transferred from the coyote’s teeth. They had to take Daisy to the Metro Animal Emergency Clinic in Burnside for surgery. There, Harmes learned the situation was dire. Daisy is 12-and-a-half years old and has a heart condition. The doctor asked her to consider making the most difficult decision any pet owner must make. 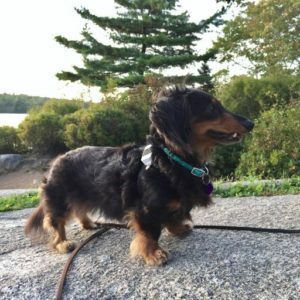 The odds of making it through the surgery were 50-50 and the vet needed to assess the little dog’s quality of life, asking if Daisy had mobility issues. They decided to go ahead with the surgery. Harmes said Dr. Karen Kaiser called her at 2 a.m. to say the surgery went well. They opened her up and checked extensively for damage. They found a puncture in her kidney and severe muscle damage on her side. Daisy is home now but not out of the woods as far as her health is concerned. She must be given pain medication and antibiotics to combat the severe risk of infection. But Harmes said Daisy will never have the run of the property again. Butch Galvez, a wildlife technician in Waverley with the Department of Natural Resources, said they see this sort of thing every year. It’s a wooded area, it happened near dark and there was some separation between owner and pet. He said the dog likely knew immediately that the coyote was there and whether it was curiosity or territorial aggression is hard to say. Galvez said he will also talk with residents in the area to see if there have been previous sightings or if someone might have put out food for other wildlife. Even bird seed or apples will attract coyotes. While Galvez said while attacks on humans are rare, it is recommended that children have basic awareness. 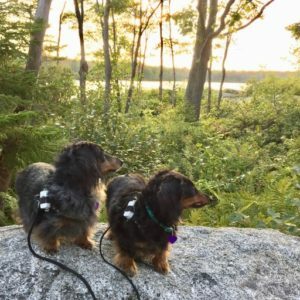 As dog owners, we look to products like the iota GPS Tracker to provide backup security for our dogs containment system, whether we have a fenced yard, use a tether or we boundary train our dogs. Most of us want something that is going to give us good coverage, have long battery life, and is affordable. 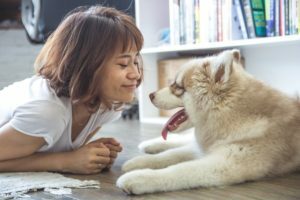 There are a variety of trackers now available, however, it looks like the Iota Tracker is hitting the most marks on the dog owners “must have” list. The iota Tracker is small enough and light enough to fit almost any size dog. My 10 lb dogs wear theirs on their harness’s. The iota has a long range of 1 to 4 miles; using both GPS and Bluetooth to track your dog. It’s rechargeable battery will last from a few weeks to a few months depending on use. It’s price is mid-range at $199 with no ‘extra’ charges like a lot of the cheaper trackers that require a monthly service fee and/or cellular costs. Beyond that, the Iota is also waterproof, as in submersible. That’s a plus for all the Lab and water-loving-dog owners. However my dogs, if they had it their way, wouldn’t even have rain touch their “iota’s”. 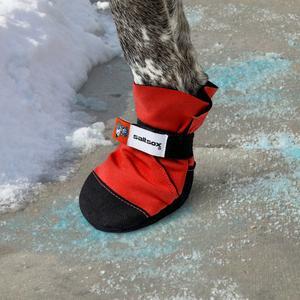 It’s durable and securely attaches to your dogs collar or harness. And the entire system; the tracker, the home base and the free app, are easy to set up and use. Typical of iota, they promised when I bought my system to upgrade the software to include an activity monitor. True to their word, I can now set goals and monitor my dogs’ activity levels. Tracking my dogs activity level throughout the day may help with early diagnosis of any health problems as well. These are the kind of extras that makes iOta a great all around product. The iota home base gives you 1 to 4 miles of coverage. Wow! That beats any Bluetooth option with an average coverage of about 100 feet. Also, it is half the price of the cheapest hunting dog quality GPS system (which are bulky, have an antenna sticking up and aren’t available for every size dog.) The iota Tracker smartly included Bluetooth with their GPS tracker, making it easier to pinpoint a dogs location. This kind of thinking that really makes the iota Tracker the best value for your money. 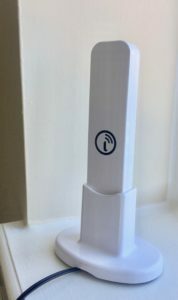 No GPS coverage outside of the 1 to 4 mile range (think hiking) until other base stations are running in your area which may or may not happen. The iota Tracker helps to keep your dog safe at home and while walking in your neighbourhood. It does not give you GPS coverage outside of the home base range of 1 to 4 miles (without more home bases covering your area). This means that hiking with your dog outside of your neighbourhood will depend on the Bluetooth only coverage, no GPS. 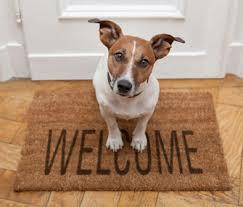 Statistics do show that the majority of dogs that end up lost have escaped from their home. This is probably due to dogs being left on their own while on their own property as opposed to being with their owner on a walk. The iota is not the most expensive GPS tracker with ‘hunting dog quality’ trackers starting around $400. But it’s not as upfront affordable as the $50 Bluetooth trackers. However, you can’t beat that there are no monthly fees. The base station is a great, modern design but the tracker, which does complement the base station, ends up standing out on the collar. Simply offering a black option would solve this problem. Overall, the iOta GPS Tracker is still my favourite dog tracker available. The pros out weigh the cons for me, but every dog owner is different. I’m impressed with the company getting so much technology into this small box, a lot of bang for your buck. So far they are true to their word with upgrades. And in places like San Francisco iota Tracker owners are living the dream knowing the entire city is covered with home base’s. Check out the coverage map on their website to see how this option is spreading. No product or money was given in exchange for this review. I bought and paid for my own product. 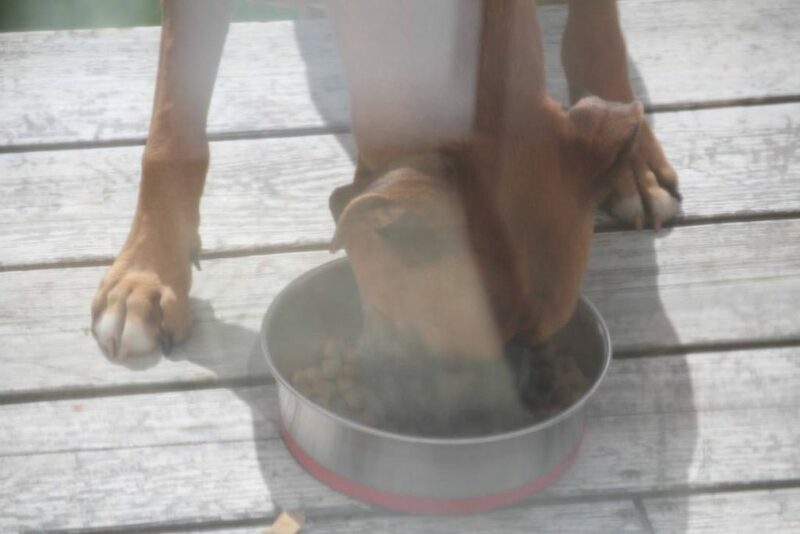 The Hubbards Boxer was first spotted and reported to us by Nicole on Friday, May 5, 2017. Little did we know that was going to be the beginning of a very busy week of sightings. We had to map out all the sightings. He was seen multiple times crossing the 103 Highway (phew! 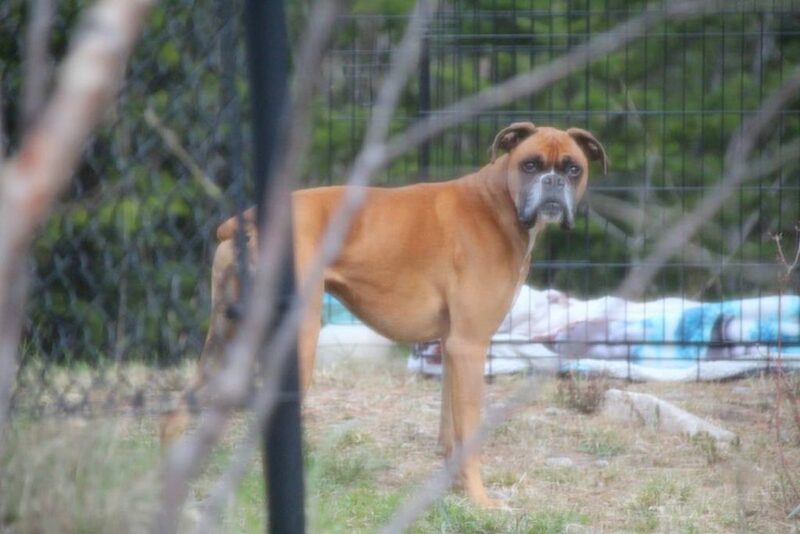 ), then the old number 3 highway, and along the rails-to-trails paths, near cottages and rec centres, by local businesses… he was spotted a lot, but we never heard of an owner looking for a lost boxer. Sigh! 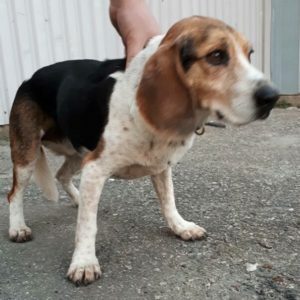 We advised all to immediately report sightings to the respective Animal Control Services for either Halifax or Lunenburg Counties, as he was roaming between both municipalities. People didn’t just see him and leave him, they all tried to help him but he would have none of that… if approached or called to he may stop for a second to look, but then he was off into the safety of the woods. It was such a relief to know he had a good feed. Well done! Another sighting at the same location late that night and again the next morning. Such a handsome boy. He was very aware of every movement and sound. It must have been exhausting for him, but he was in survival mode. All he wanted was food, water, and shelter at this point. He had everything he needed… a comfortable bed and blankets, regular feedings, and fresh water. He was looking a little thin from his week on the run, but he was still in excellent health. Boxers are very athletic dogs with a deep chest, tight waist and long legs. He would come back to the house looking for more food. We didn’t want to over feed him as we needed him coming back to the same location looking for food in order to work out getting him to safety. Things were moving along quickly…faster than we could get a live trap to the location. He’s Inside. What Do We Do Now? That evening, things changed considerably. He was feeling very confident and so were Tanya and her family. With the door ajar, their dogs and cats away, a gate up… he almost came inside looking for more hot dogs. Now, I can’t say I recommend doing this with a dog you don’t know. 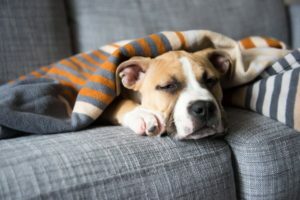 There was definitely a point missed where you lure a dog into you, gaining its trust enough to touch them and put a leash on them… and then decide if you are going to bring them into your home. It was pretty exciting seeing the progress they were getting. Being the kind animal loving people they were, Tanya and her family just couldn’t let him stay outside in the cold. He certainly found the right family to ask for help. You see his confusion in this video. He want’s the hotdog and he may even want to be inside, but he’s been in survival mode for a week and he’s nervous. And we don’t know what his life experience has been up to this point either. His ears keep listening behind him, his exit route, to make sure he can escape if he needs to run. He creeps forward, but only for the hot dog. Then he backs out again. There is a lot of body language going on and basically, it all says he’s unsure of being inside and being near people. 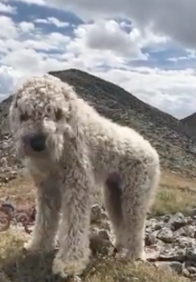 Awe, you did the right thing (not necessarily in the right or safe way but you trusted your gut) Tanya and we all can’t thank you enough for getting this beautiful dog to safety. You and your entire family are this dog’s heroes, and ours too. HAPPY ENDING: Safe n’ Sound! Yeah!! 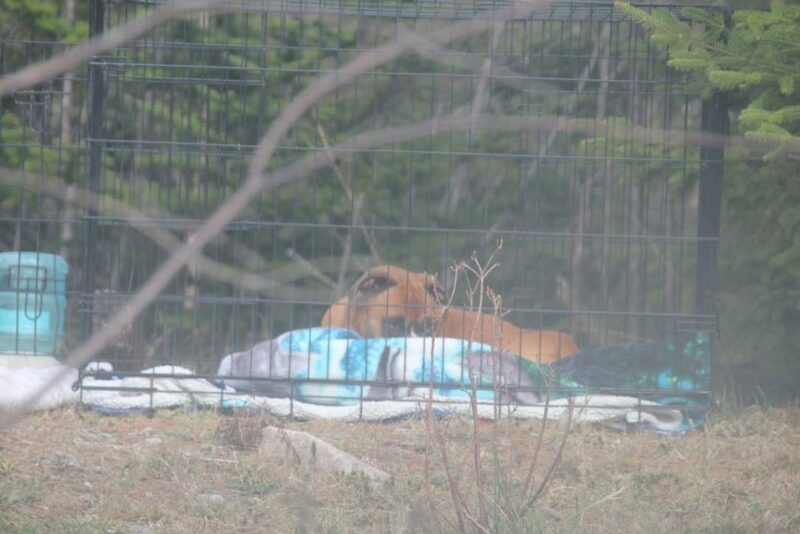 Tanya let us know that he has settled and she has called Brian, the Animal Control Officer for Lunenburg County who worked hard that week trying to keep up with the sightings, to come and get this tired fella. 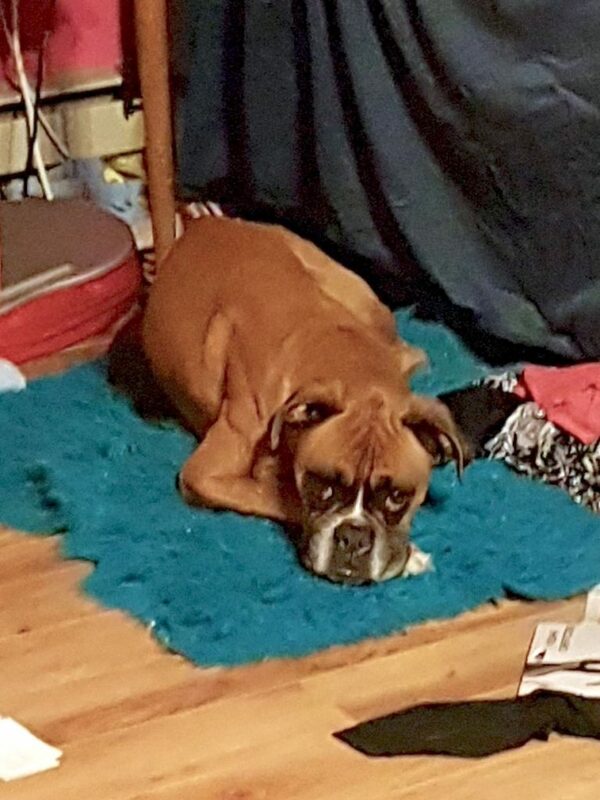 What a story… This beautiful Boxer arrives in this community seemingly out of nowhere (being investigated now), spends a week on the run and crossing very busy highways, and everyone is trying to help him get to safety. Ultimately, he picks himself a family and ends up sleeping in the youngest kids bedroom like this is where he needed to be all along. He’s safe, in the care of Lunenburg Animal Control where he is learning to relax and not worry about where his next meal is coming from or if he will be cold tonight. It seems unlikely his owners will be found and if that is so, he will go into rescue and be re-homed to his FUR-Ever Home. 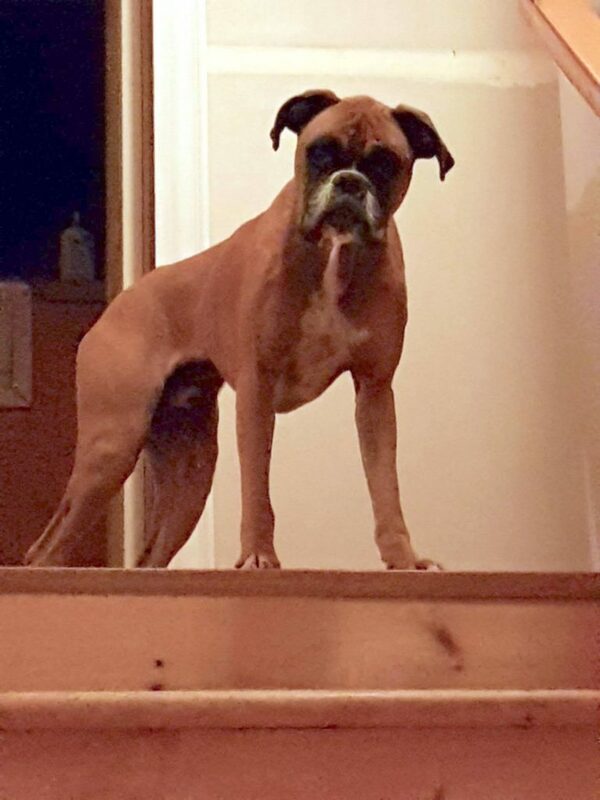 We want to thank everyone that was involved in helping this handsome boy… everyone that stopped and tried to get him to safety, who reported sightings to us, Nova Scotia Lost Dog Network, and to Animal Control in both Lunenburg and Halifax Counties, and to all the folks that cared and shared his info in hopes of finding his family. And once again, a huge thank you to Tanya and her family for doing everything in their power to get this dog to safety and to ACO Brian. You did it! Yeah! Yippee!! It’s another Happy Ending.